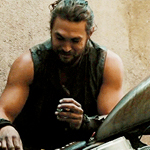 ROAD TO PALOMA is the directational debut of actor/barbarian Jason Momoa, who also co-wrote and stars as Robert Wolf, a rugged but charming motorcycle ridin fugitive. Six months ago he put on face paint and killed the man who raped and killed his mother. Since then he’s been laying low, “up in the Sierras mostly,” doing Jason Momoa things like building a fence, repairing cars and motorcycles, pushing wheelbarrows, drinking out of a tin cup next to a campfire, smoking loosely rolled cigarettes, and riding around desert highways, sometimes with a mask, but never with a helmet. This is a road movie, and all along the road he has old friends and family who he loves to sneak up behind and growl or grab, and there is always smiling and lifting people and spinning them around. He is loved by the full range of age groups from children to the elderly.